When you find the courage to STAND OUT, You begin living your life in full BLOOM. You begin living life in full BLOOM. 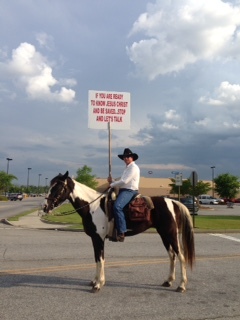 The cowboy sat motionless on his horse in the middle of a busy intersection between Wal-Mart & Sam’s. In his left hand, he kept a tight hold on the reins, and in his right hand he hoisted a plain white sign. The simple red font formed a message I couldn’t quite make out as I turned into the busy parking lot. What I did see were the words JESUS CHRIST. Ever the curious type, I made a quick u-turn and headed back to read the whole message. Without a word, he turned the sign around so I could read it. He agreed and swiveled his body around to face me. His expression didn’t change. I took the shot and thanked him saying I was a writer, and this picture would be on the internet more than likely. Seeming to be a man of few words, I took that as the end of our conversation and drove off to do my weekly shopping. I couldn’t stop smiling as I loaded my cart with apples, lemons, and a huge container of Nutella. (It’s nuts so it’s healthy.) I kept grabbing my phone to look again at the picture; this man’s willingness to do something different made him stand out on a crowded Saturday morning. Our culture promotes conformity, yet the unusual ones, the conspicuous, attract the most attention. It takes strength to separate from the comfortable place of familiar. Are you willing to be weird, wild, and wonderful? I asked some little friends of mine this question after telling them a story about an old pair of weird blue jeans I have. 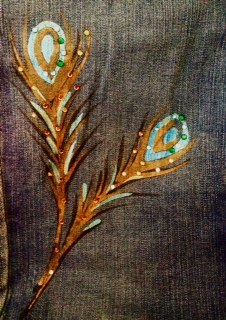 They are ornately adorned with peacock feathers up and down both legs. They are unusual. (The hubs hates these jeans.) See? Since the day I brought them home, he scowls when the feathers emerge. I haven’t worn them in years, but my conversation with my buddies sent me digging in the way-back tombs of my closet. These jeans are kinda strange, man. I get that, but it’s what I like best about them. The day after my talk, one of my favorite friends brought me this poster. She gets me. Really, why should we try so hard to fit in when we were born and created by God to stand out? I am pretty sure Dr. Seuss and the cowboy would’ve been great friends. Neither of these men were willing to be a normal nobody; both chose a path where they no longer blended in. In Paul’s letter to the Phillipians, he encourages them to be stand out in their generation. He was calling them to shine in a dark, unbelieving world Paul described as “warped and crooked”. He was asking them to do something different; be obedient and exercise humility. Our Master Creator designed each of us with unique, diverse, distinct qualities for a specific purpose: He calls us to stand out against the dark culture around us. Obedience to God’s Word, humility, surrender, and forgiveness are all qualities that distinguish His Children. He planted a purpose in our hearts that will take boldness and fearlessness to live. 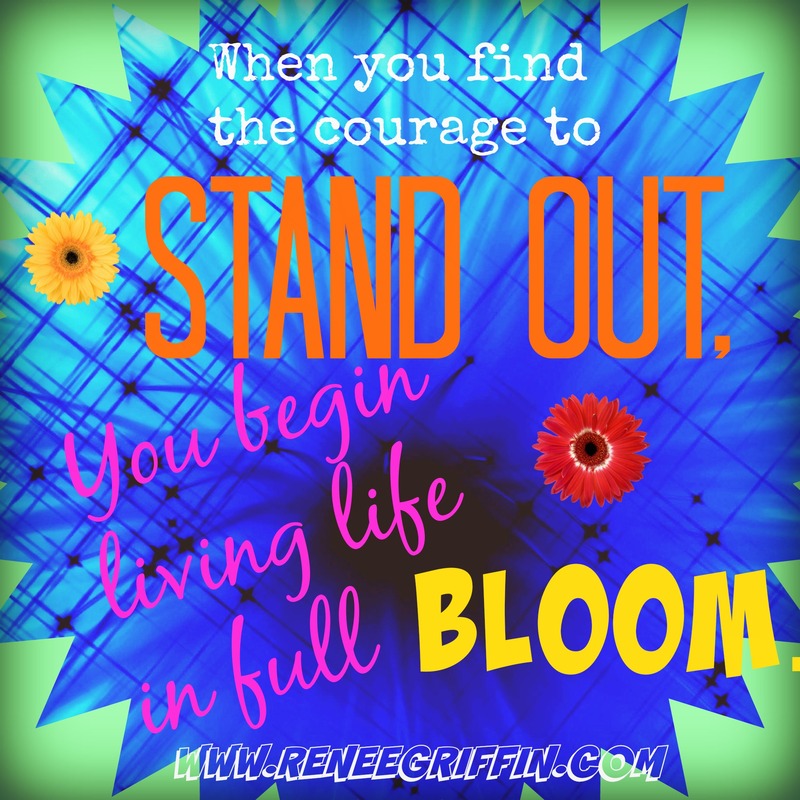 When we find the courage to stand out, we begin living our lives in full bloom. Are you willing to STAND OUT? To shine? To live life in full bloom? Let’s do this. Let’s do it together. If you need help getting started, let me know. You can borrow my jeans. I’m linking up this week with several different friends. I encourage you to click on all these links and discover some beautiful treasures. Kelly Balarie, Suzie Eller, & Susan B. Mead. I so enjoy reading your blogs…keep it up! Waiting on the next one already! love you! Love you, too! Thanks for always cheering me on. Love your color girl. You do stand out. And I love the jeans! I’d buy them. Love this! Love you! You are such a great writer! Thanks for sharing! I miss you! Hope all is well in your new place. I just love this cowboy! What an awesome picture and “conversation” you had. Two Jesus hearts meeting at the corner of a parking lot. So unique, just like God. He is like no other and we should be, too! Thanks for encouraging us to step out of our comfort zone and do something special to reach others for Jesus. Love it! I loved the cowboy, too! I kind of blinked a few times to see if he was really truly real. God never ceases to amaze me. Praying I keep my eyes open so I don’t miss a thing He is trying to show me. Thanks for coming by and always, always encouraging me. You are most appreciated. Renee-Well after my struggle with the “bloom” prompt this week, this is what I needed to read. But that misses the point, doesn’t it? This actually flows right into our new prompt of “Brave” for me. I have to be brave to bloom the way I am meant to bloom. I’m #127 on LinkedUp and given this lovely opportunity to read your beautiful blog post! I had written an earlier post about Choosing Holiness, and realize as I read your blog, that you write about the true meaning of holiness–to be set apart for God, to be different!! What a wonderful post, and so happy to get to read your wonderful writing! I’m #127 on the LinkedUp which gives me a great pleasure to read your wonderful blog and writing!! I wrote an earlier blog about Choosing Holiness, and as I read your words, I realized you’re writing about the meaning of Holiness..which means is to be set apart for God, to be different for God. 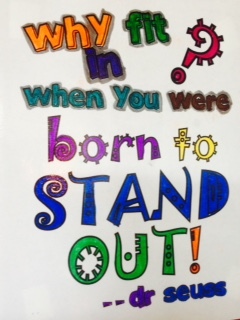 Yes, we should stand out from the crowd, whether it’s on a horse with a sign,standing strong for our values, or speaking the truth in love to those around us! I absolutely loved this! YES! It’s time to stand out, and stand apart as His holy people! What a great story – I loved the cowboy! I saw a pic of you in the jeans and loved them on you! Thanks, Suzie! Old things become new again. Now while I likely cannot fit in those jeans (lol), I am certainly adopting and sharing that attitude Girlfriend. I love the way you captured these moments and developed them. So blessed I got to drop by and visit you this weekend! Keep writing for Him! Yolanda! Hi! Your encouragement means so much. I really appreciate you stopping by and reading. You, sweet friend, already stand out for Jesus.